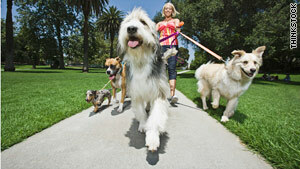 Owners of pampered pets are willing to pay people to take their pooches for a walk. (CareerBuilder.com) -- Although the job market today is improving, there are still 15 million unemployed people in the United States, according to the Bureau of Labor Statistics. That's 15 million people looking for something -- anything -- to earn a few extra bucks. In March 2010, the number of people working part time for economic reasons (also referred to as involuntary part-time workers) increased to 9.1 million. According to the BLS, these people were working part time because their hours were cut back or because they were unable to find a full-time job.